Type 2 diabetes is a progressive disease characterised by insulin resistance, progressive loss of β-cell function and reduced insulin production, leading to hyperglycaemia. 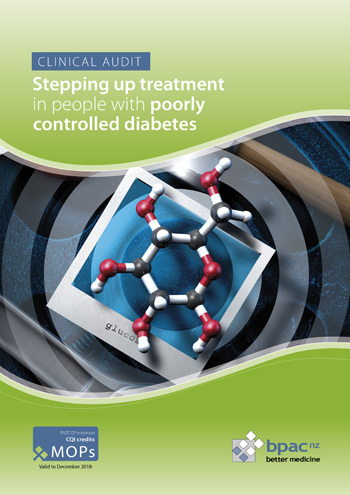 The mainstay of treatment for patients with type 2 diabetes is individualised lifestyle modification, e.g. focusing on improving diet and increasing exercise. Oral hypoglycaemic medcines are often initiated at the time of diagnosis; metformin is first-line, followed by a sulphonylurea, and sometimes additional oral anti-diabetes medicines, such as arcabose or pioglitazone. For many people, glycaemic control is less able to be achieved using oral medicines alone as their diabetes progresses over time. Many of these people will eventually require insulin to control glycaemic levels. New Zealand guidelines recommend that insulin initiation for people with type 2 diabetes can be managed in primary care where possible, with additional support as required. Ideally, a target HbA1c level should be individually agreed upon after a discussion with the patient at the time of their diagnosis or soon after, and then regularly revisited. Keeping HbA1c levels below this target is a measure of good control. An HbA1c > 64 mmol/mol is considered a marker of poor control. The decision to step up treatment, particularly to initiate insulin, needs to be balanced with other factors, such as the patient’s age and therefore their long-term risk of complications, the patient’s ability to manage a more complex treatment regimen, appropriate family/whānau support and the patient’s acceptance of the need for insulin. For further information, see: “Improving glycaemic control in people with type 2 diabetes: Expanding the primary care toolbox”, BPJ 53 (Jun, 2013) and “Initiating insulin in people with type 2 diabetes”, BPJ 42 (Feb, 2012). The aim of this audit is to identify people with type 2 diabetes enrolled in the practice who would benefit from more intensive management, such as the initiation of insulin. The recommendation for the audit is that all patients with type 2 diabetes should have a predefined HbA1c target recorded in their notes, and be undergoing lifestyle interventions and prescribed appropriate medicines, so that their HbA1c is under their target level. Any patient who is not meeting their target HbA1c requires further assessment and should have their treatment stepped-up as per New Zealand guidelines. Identify patients in the practice with type 2 diabetes who have an HbA1c result > 64 mmol/mol in the previous twelve months. Assess whether they have a target HbA1c recorded in their notes. The patient’s notes should indicate that the clinician reiterated and discussed the importance of diet and lifestyle measures and the need for proper compliance with medicines. The clinician should also have intensified the patient’s treatment in order to reduce their glycaemic levels; this may have involved initiation of insulin. As the long-term outcomes associated with poorly controlled diabetes are severe, the standard for this audit should be high. A recommended standard would be for 90% of patients with HbA1c > 64 mmol/mol to have had their treatment reviewed and intensified. There should ideally be an improvement in the achieved percentage between the first and second audit cycles. All patients with type 2 diabetes who had an HbA1c > 64 mmol/mol at some point in the past 12 months are eligible for this audit. You will need to have a system in place that allows you to identify these eligible patients. Many practices will be able use their PMS reporting system, such as best practice intelligence or a similar product, to find all patients with an HbA1c > 64 mmol/mol. Alternatively, if a reporting system is not used, patients can be identified by running a ‘query’ through their PMS system for HbA1c results > 65 mmol/mol. The number of eligible patients will vary according to your practice demographic. If a large number of patients are be identified, a random sample of 20-30 patients should be taken (the first 20-30 results returned is sufficiently random for the purposes of this audit). Use the data sheet to record your data. A positive result is any patient that has a tick in column A, B and C. Any patient without a tick in column A, B or C is a negative outcome. Calculate your percentage achievement by adding up the number of audited patients with a “positive result” (all those with a tick in column D) and dividing this by the total number of patients audited.